Prep Day Directions: thaw shrimp and remove tails from shrimp. combine 5 tbsp. mayonnaise, 3 tbsp. Chili Sauce, & 1 tsp sriracha in a bowl. Once mixed, toss shrimp until well coated. Place in fridge until ready to eat. Serve Day Directions: Place 3/4 cup mozzarella cheese on each pizza crust. Divide the shrimp between the two pizza crusts. Preheat the grill, leaving half of the burners off for indirect heat. Lightly spray the grates so the crust doesn’t stick. Place one pizza on the grill and close the grill. Grill directly on the grates for about 8-10 minutes or until crust is golden and cheese is melted. Remove from the grill, and top with scallions and cilantro. **I used cooked shrimp, so you don’t need to cook it before hand, you can always do so before putting the shrimp on the pizza if you like it cooked more. Prep Day Directions: In a small freezer bag combine red pepper, chives, dill, lemons juice and tabasco. Label a sleeve of Ritz crackers and 3 cans of salmon for the pantry. TO PREPARE: On hand – 2 eggs and oil. In a medium bowl break up the canned salmon with a fork. Add about 1 cup cracker meal and work through the fish. Add the eggs, pepper, chives, dill, tabasco, and lemon juice. If the mixture is too wet add more cracker meal. Form 3-inch patties about 1 inch thick. You should have 8-10 cakes. Serve Day Directions: Fry in hot oil in a single layer until golden, 3-4 minutes on each side. Drain on a paper towel-lined plate. Prep Day Directions: Heat olive oil and butter in large skilled over medium heat. Add rice, carrots, celery, and onion; cook, stirrying, until rice is golden brown, 5- 7 minutes. Cool. Divide rice mixture among 4 1-gallon freezer bags. Into each bag, measure 2 tsp bouillon, t tsp parsley, and 1/4 tsp pepper. Seal and freeze. Serve Day Directions: To cook, place frozen pilaf in a medium saucepan and add 3 cups of water. Bring to a boil; reduce heat and cook, covered, for 30ish minutes, or until water is completely absorbed. Prep Day Directions: Combine onion, peppers, chicken, garlic, orange juice, water, salt, and curry powder and mix well. Place in freezer bag and freeze. Serve Day Directions: Thaw in fridge overnight. Put in a 3-4 qt crock pot, cover and cook on low for 6-7 hours until chicken is thoroughly cooked. Cooking time may need to increase if you put it in frozen. Check it at 6 hours and shred the chicken. If it is done, then proceed to the final step. In small bowl, combine whipping cream and cornstarch and blend with wire whisk. Stir into crockpot, turn heat to high, and cook for 15-20 minutes, stirring once, until sauce thickens. Serve over hot cooked rice with peanuts and raisins, more curry powder, and condiments. Optional- sprinkle of Parmesan cheese, you provide. Prep Day Directions: Cook shells al dente. Thaw and drain spinach. Mix together spinach, cheeses, garlic and basil. Stuff shells. Place on baking pan and flash freeze for two hours. Package and label shells and sauce. Serve Day Directions: Place stuffed shells in 8×8 baking dish and thaw over night in fridge. Cover with pasta sauce and sprinkle with Parmesan cheese. Bake at 350 for 30 minutes. Prep Day Directions: Measure and mix cheeses. Put in bag and seal. Mix all remaining ingredients, except beans and gnocchi. Put in bag and seal. Serve Day Directions: Thaw in refrigerator overnight. Cook gnocchi according to package directions. Cook veggie mixture in a skillet on the stove until warmed through. Rinse and add white beans. 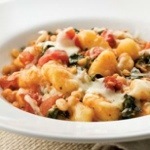 Add cooked gnocchi to skillet and mix in cheese until melted. Enjoy!